Students at the Rochester Institute of Technology have nothing on the mayor of Topeka, Kansas when it comes to groveling for Google’s attention. If you thought the former’s voting to get their college campus on Street View seemed devoted, mayor Bill Bunten one-upped the tech students by changing the name of his city from Topeka, Kansas, to Google, Kansas. Bunten instituted the change on Monday, dubbing Topeka, err… Google, “the capital city of fiber optics” in an attempt to get the real Google’s attention and become one of the first cities to participate in its trials of ultra-fast fiber optic Internet service. Rather anticlimactically, the change is only effective for the month of March, after which Google will revert to Topeka, the city famous for prairie potatoes, the first Golden Eagle chick hatched in captivity, and Brown v. Board of Education. 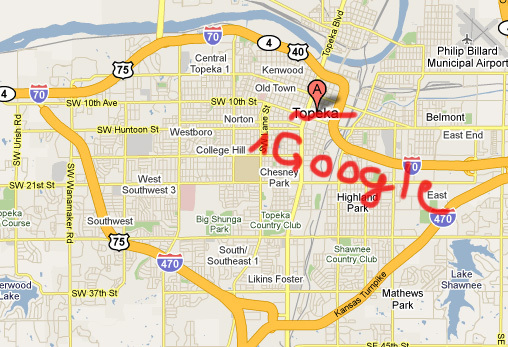 Legal red tape prevents Topeka from changing its name in the most technical sense for only a month, so the change technically stands as a proclamation calling for the city to be known as Google, Kansas. The city pulled the same stunt back in 1998, changing its name to “ToPikachu” in recognition of its status as ground zero for the release of Nintendo’s Pokémon game. Bunten encountered no resistance from the city council when he proposed the change at a meeting, according to the Topeka Capital-Journal. “I support pushing the ‘send’ button,” Councilman Jeff Preisner said in response to the proposal.